Win LFW tickets with Burt’s Bees! It’s that time again – this week sees the launch of London Fashion Week where the world’s fashionistas descend on the capital to have a peek at next season’s trends. The weekend after also sees the best pop-up shopping destination take over Somerset House, where there are designer threads galore to pick up at discounted prices during London Fashion Weekend. There will also be a new area to look forward to this season: The Weekend Retreat. 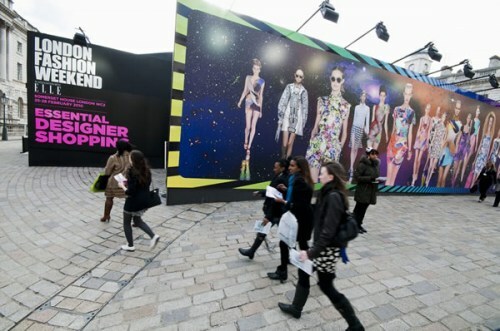 “The Weekend Retreat is a brand new area for Vodafone London Fashion Weekend. Once you are all shopped out (if this is possible) you can now go and get that extra bit of pampering at our NEW section. Book yourself in for a mani/pedi, a brow shape or a relaxing massage to totally top off your day of fashion perfection!” One of the brands offering some much needed pampering is Burt’s Bees, selling their fabulous new body spa range, as well as two therapists giving hand massages using the new body butter, so you can carry all those new purchases home with you. You’ll come away looking and feeling fabulous. In celebration of this, Burt’s Bees have given me a fantabulous prize to share with one lucky reader. Not only do I have a set of the new body range to give away, but also tickets to the Sunday of LFW for the winner and four friends. A pampering weekend treat for you and your girlfriends? Hell yeah! To enter, all you have to do is comment below with your name and a valid twitter/email address. Good luck! T&Cs: You must be a follower of this blog to enter. Closing date is Friday 16th September. Winner will be notified and must respond within 24hrs or another winner will be chosen. One entry per person. Open to UK residents only. No accomodation or travel is included. Contents of the Burt’s Bees prize to be decided by Burt’s Bees. I have just been debating over whether or not to buy tickets for LFW, this would solve that problem! Love Burts Bees too, I use to make regular use of the samples when I worked at John Lewis.Twitter is LaurannpEmail is lfpumffrey@hotmail.co.ukThanks! Burt's Bees products are amazing! Adore the blog and love Burts Bees – not tried the hand cream but can imagine if it does to my hands what the lipbalm does for my lips we are onto a winner!